While it may not be possible for the average man in the street to get hold of a Titan arum - Amorphophallus titanum or a Corpse flower - Rafflesia arnoldii, if you have your mind set on growing one of the world's largest flowers then all is not lost! 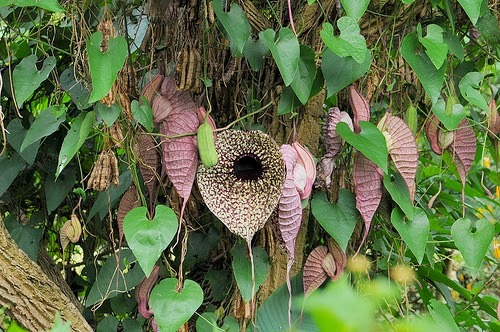 Native to the Caribbean and Central America, the Pelican Flower - Aristolochia grandiflora is right up there with the flowering giants. It was named in 1788 by Olof Swartz (1760-1818), and has one of the largest flowers of any New World species. While the undoubtedly strange flower structure is not as large as the Amorphophallus or Rafflesia species, it does share one common characteristic - an outstanding odour! 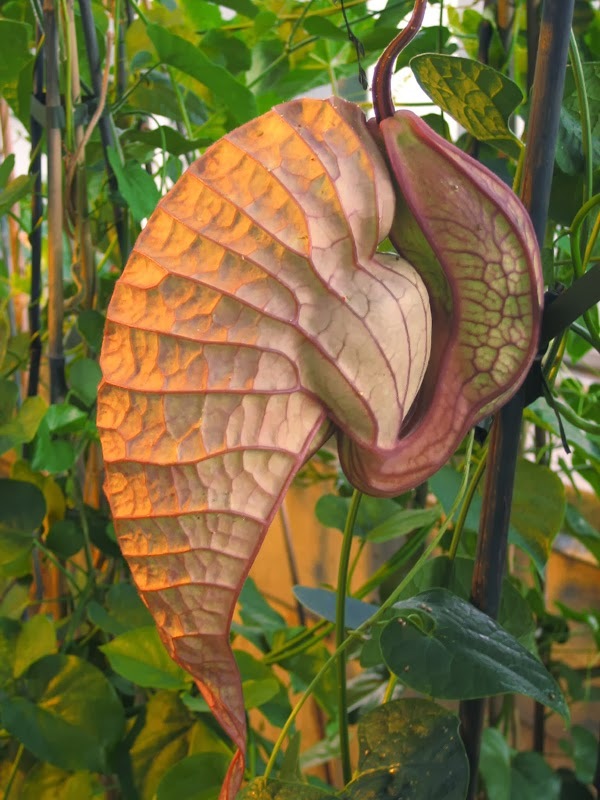 Typical to other species within the Aristolochia genus, the A. grandiflora flower is pollinated by flies and wasps. 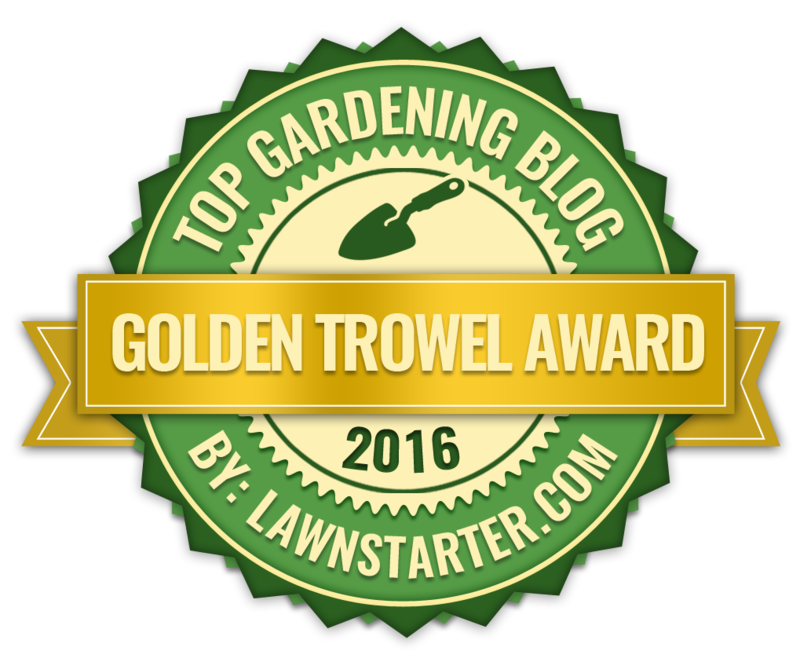 This is why the Pelican flowers has evolved such an usual shape - it is a highly efficient trap! The flies and wasps are attracted to the flower as the odour produced (a combination of essential oils) smells rather strongly of rotting flesh. The unsuspecting fly travels down the tubular part of the flower to where the reproductive organs are found. The tube is lined with downward facing hairs that prevent the fly from moving out. The reproduction process has three main phases. In the first phase, the fly carries pollen from other flowers which are deposited onto the stigma as it makes it way to the bowl-like structure at the base of the trap. During the second phase the fly is trapped inside the flower, but it survives by eating nectar produced along the walls of the bowl. While the fly fumbles around looking for a way to escape the stamen releases its own pollen which then becomes attached to the fly. Luckily for the fly this phase lasts one day as the downward-facing hairs wither, allowing the fly to escape. Two days later and the flower will die back and fall from its stem.